I came across this idea on superteacherworksheets.com, although I’m sure many others have also used or made something similar. It’s quite straightforward, pupils complete 9 calculations, find the answers on the puzzle pieces, and put them in the same order as the questions to make a picture! So I made this one for the decimal division that one of my groups is currently working on. I don’t give the scissors out until the questions have been attempted (as otherwise pupils can easily put the puzzle together!) The bonus of having the pieces with the answers on is that pupils can self-check as they are working. There is no reason for the cutting and putting together of the puzzle, other than it is a motivating factor to complete all the questions, giving the pupils well needed practice! When preparing a resource to take and share at mathsconf4, I wanted to share something which I find valuable and seems to make a difference to pupils learning. So I chose a resource, originally from TES (complex_number) for a topic I find pupils struggle with, yet is a basis for so much mathematics: converting between fractions, decimals and percentages. The resources I use are for groups with little or no understanding of the connections between the three as they start off quite basic. It starts with a slideshow of artwork where proportions could be viewed as a theme. This includes works from Piet Mondrian, Victor Vasarely, Ellsworth Kelly and Frank Stella. With a quick review of what fraction, percentage and decimal (based on a 100 square, so using £s and p to support the decimals) mean, pupils then create their own artwork on their 100 square. 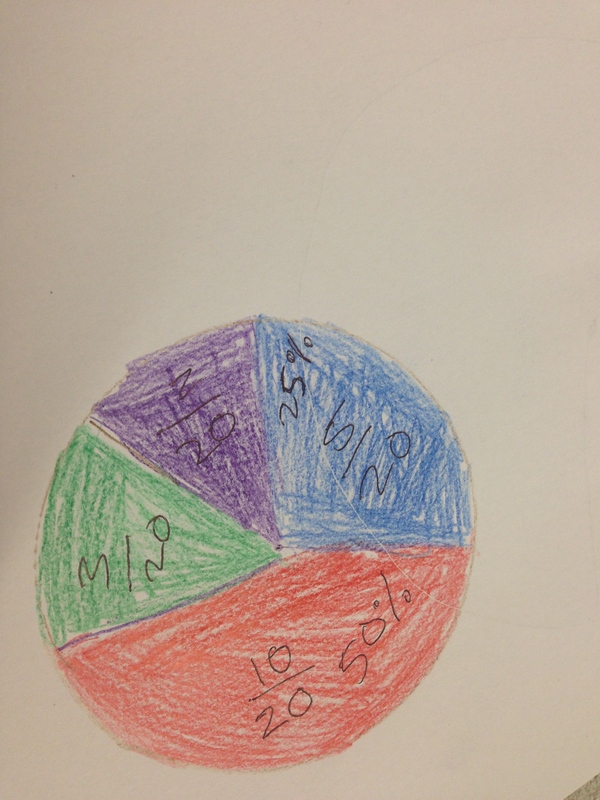 They then use their art work to write the fraction, percentage and decimal of each colour used. The advantage of using this resource has been to consolidate the connection between the fraction out of 100 to the percentage. The next step is to move onto a 50 grid, 25 grid, 20 grid and 10 grid, and hence the need to change the fraction to out of 100 in order to write the percentage. 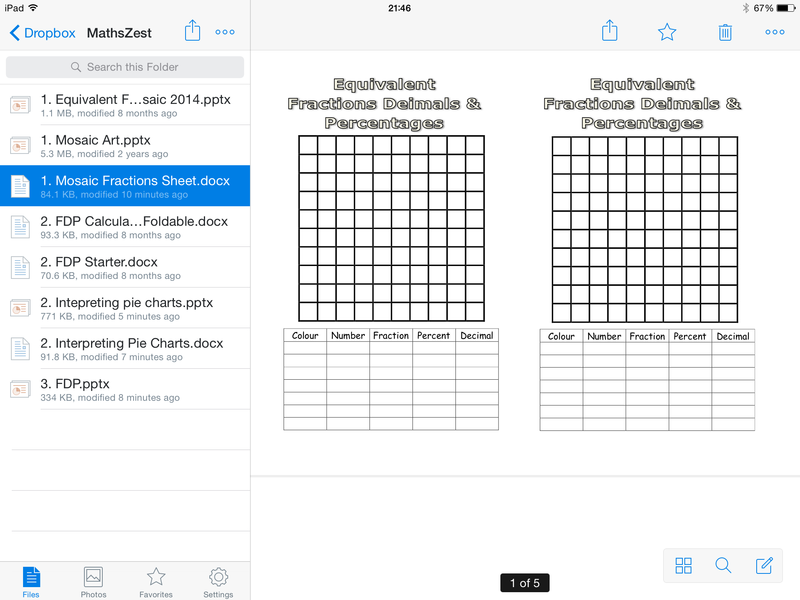 Accompanying the grids are some fraction, percentage and decimal tables, with an extra column for the fraction out of 100, for pupils to practise their conversions. 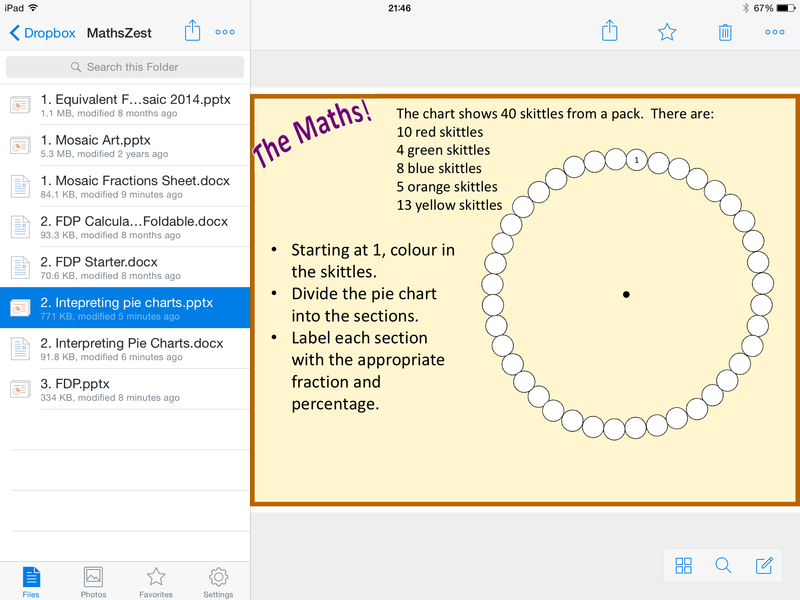 A similar resource I’ve used is a skittle pie charts. 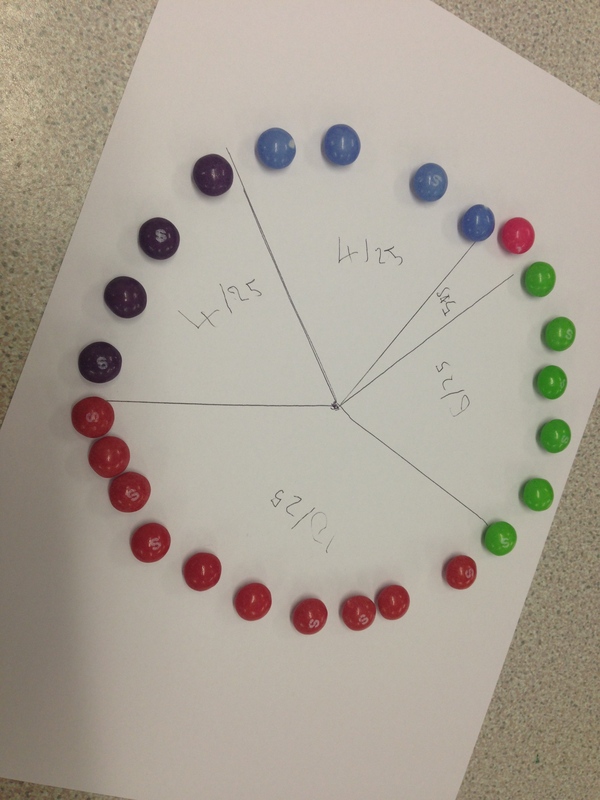 I’ve done this by giving out skittles (20, 25 or 40) and pupils to make their own circles, grouping the colours, section ing them off and writing the fraction, percentage and decimal for each section. 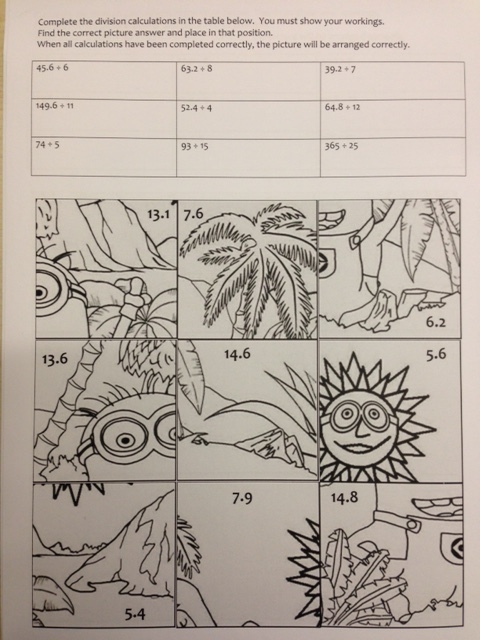 I’ve also given out a template for pupils to colour in given skittles (this was actually to help with interpreting pie charts, but linked in nicely to the fractions, percentages and decimals work the pupils had completed previously. 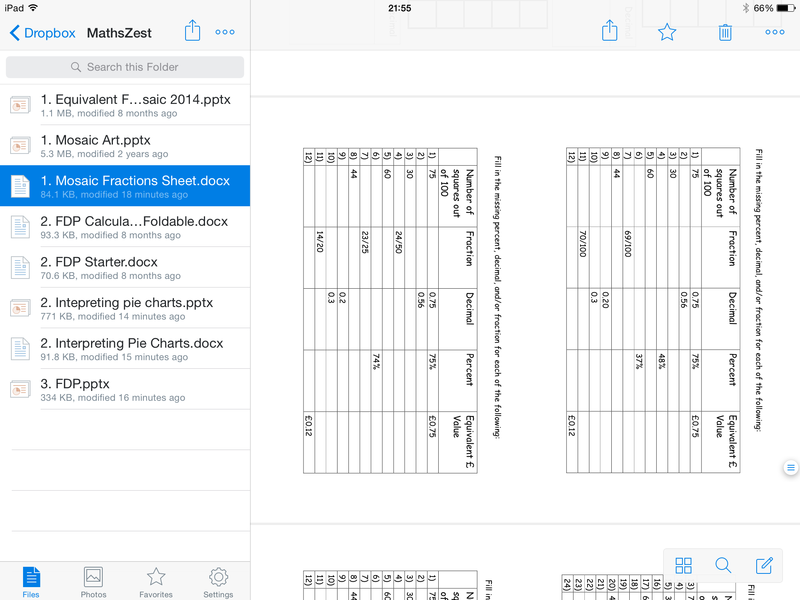 All the files are linked below to use and adapt as wished! 1. Equivalent FDP Mosaic 2014 1. Mosaic Art 1. Mosaic Fractions Sheet 2. 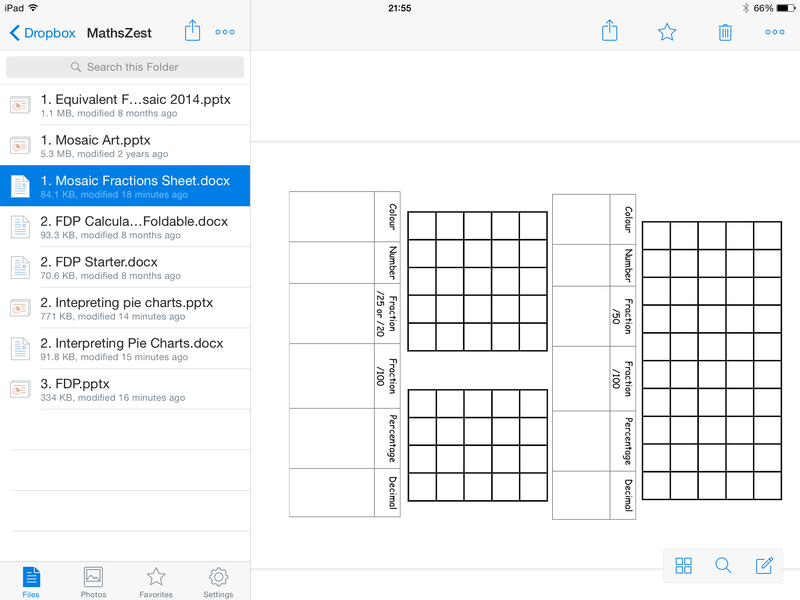 FDP Calculation Foldable 2. FDP Starter 2. Interpreting pie charts 2. Interpreting Pie Charts 3. FDP The original idea and basis for these came from TES (complex_number) and an American website, all freely available. I’ve adapted into my own documents and made them to suit my groups. Thanks, as always, to the originators of the ideas to sharing so freely, allowing me to use your ideas in teaching my groups.